Welcome to the Capstone! Bama Bound orientation sessions help the newest members of the Honors College register for classes, find out about key activities and learn about life at the University. This page will be continually updated with a full slate of information you need to know during your orientation sessions. Are you planning your visit now? Check out the Bama Bound Orientation Schedules or contact the Orientation Office. Want to know what courses we offer? Go to Honors Courses. This will give you a great sense of the breadth of classes offered in the Honors College and the different ways that students can earn Honors credit. Now you’re ready to learn how to register for a course. You’ll soon learn that DegreeWorks is a great tool. Check out this tutorial page for more information. Honors College works in partnership with all major academic advisors. 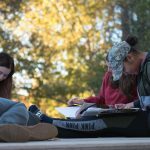 Honors cannot clear a registration hold; however, the Honors College can help fit in Honors classes alongside the coursework suggested by a student’s major advisor. Remember, students can add or drop classes all the way through the first week of classes, so make sure to keep checking full courses that you want, in case seats become available. Q: What should I take freshman year? A: Talk with your academic advisor in your home college while at Bama Bound! We suggest considering math and foreign language, to ensure that material learned in high school is not forgotten, as language and math skills tend to diminish quickly over time. Another important course to take is English Freshman Composition. Q: What English Composition course should I take freshman year? A: An ACT score of 28 or an SAT score of 1350 will qualify you to take EN 103. This course combines EN 101 and 102 and gives students a total of 6 credits, with a qualifying minimum grade. Students receive 3 credits for the course itself and 3 additional “institutional” credits upon completion of the course. Students also receive 3 Honors elective credits with EN 103. If EN 103 is full in the fall, it is sensible to wait and take the course in the spring, rather than take the non-Honors version of EN 103, which is EN 101. Please note, EN 104 is a specialized English course for students in the Blount Undergraduate Initiative. Honors students who are also in Blount may take EN 104 and receive Honors credit, but this course does not give the 6 hours. Learn more about the first year English placement. Q: How can I find out if my AP (CLEP, IB) score gives my college credit? A: Each department at UA has different minimum AP score requirements. For example, if you have taken AP Calculus, the Math Department will give you the corresponding course number and credit information for scores ranging from 3-5. The same is true for other departments. The following link gives the most current information about AP qualifying scores. Learn more about AP Credits and Course Equivalents. Q: What if my AP credits have not been received by UA when it’s time to register for classes? A: The general advice is to register for the course you think you should be in and then make any necessary adjustments after scores are reported in July. Alternately, you may take a different course you may need and postpone taking the next level of your AP course until your scores are in. Q: What other courses should I take my freshman year? A: If you have registered for EN 103 OR an Honors math, history, literature, etc., then you are well on your way to satisfying some of your Honors requirements, core, and perhaps your major requirements. Any Honors course offered offered by various departments or colleges on campus satisfies Honors elective credit but does not satisfy Honors Foundation credit. Please note, you must have at least one Honors Year One experience during your first year, and there are a number of Honors Foundation courses that satisfy this requirement. View all Honors Year One courses. Q: What is the difference between Honors Foundation and Honors Elective courses? A: Honors Foundation courses always have the UH designation and are offered only by the Honors College. They are our UH seminars, with 15 student maximum enrollment, and they fulfill the required 6 credits of UH seminar courses. Honors Elective credits are offered by various departments/colleges on campus, such as English, Math, etc., and have “Honors” in their titles, e.g., Honors American History. Together, Honors Foundation and Elective courses must total at least 18 credits to fulfill the Honors College requirements for graduation. Out of the 18 total, a minimum of 6 credits must be in Honors Foundation courses. Aim to finish your 6 hours of Honors Foundations in your first two years, especially if you will be entering a prescribed upper-division, such as Nursing or Education. Although finishing your Honors Foundation courses within your first two years is highly recommended, it is not a requirement for completion of the Honors requirements. Q: How do I look up Honors College (UH) courses and Departmental Honors courses? A: You will look up courses by going to the Student Tab in myBama. Please visit the Registrar’s website for valuable information on how to look up and register for classes, as well as how to use Schedule Builder. Q: What are some advantages to taking Honors Foundation (UH) courses? A: UH courses are small and allow you to connect personally with fellow students and the instructor. They are interdisciplinary in nature and are really interesting! Additionally, Honors courses can meet more than one requirement. UH 210 (University Honors Fine Arts) counts as an Honors Foundation and a Fine Arts core requirement. UH 101/UH 155 count as an Honors Foundation and a Humanities core requirement. UH 105 counts as an Honors Foundation and a Social Behavioral core requirement. Departmental Honors courses count as Honors Electives and count for majors or core. Do not worry too much if your classes do not work out exactly as you wish your first semester. As you move forward, you will have priority within your classification for course registration and will have better odds of getting into the classes you want. Q: What are some advantages to taking Honors Departmental courses (electives)? A: Honors courses offered by colleges/departments have lower enrollments than the non-Honors versions and are often taught by the best instructors. However, although we encourage students to take departmental Honors courses, we do not advise taking Honors Math or Science courses, e.g., Honors Chemistry 117, unless students are very talented in these subjects and/or plan to major in them. Q: When should I take Honors Foundation courses? A: You should begin completing your Honors Foundation requirement by taking an Honors Year One course. Completion of an HYO experience is a requirement to remain in Honors. Q: What is Honors Year One? A: Honors Year One is student-directed programming that helps new students engage with their fellow students and with faculty; discover opportunities and interests; and participate in areas of service. Special events, academic opportunities, and other first year-only events address the unique needs of new students. Because of the importance of engaging with the Honors College, incoming freshmen are required to participate in in ONE Honors Year One experience during their first year. Q: What courses fulfill the Honors Year One requirement? Through a combination of discussions facilitated by professors, UA administrators, and small group meetings, students gain the insight and skills needed to maximize their college experience. The small group meetings are led by student leaders who serve as peer mentors. General discussions and a short reflection paper about the 2018/2019 Common Book, American War, by Omar El Akkad, will also be a part of this course. Discussions on topics such as involvement, identity, discourse and negotiation, the Four Pillars of the Honors College, as well as reflection on the common book, will be part of this course. The 2019/2020 Honors Common Book is The Book of Unknown Americans by Cristina Henriquez. Our freshman seminars offer a wide variety of academic topics. In the fall semester, all seats in UH 155 are held for incoming freshmen. In the spring semester, UH 155 are offered to students at all levels, and freshmen have another opportunity to take these courses. For students in the University Fellows Experience and Randall Research Scholars Program, the UFE 101 and RRS 101 courses also fulfill the HYO requirement. Q: How many credits should I take my first semester? A: The first semester of college is challenging for everyone, including talented students. In addition to coursework, many other adjustments must be made, including living away from home, coping with money/time management, missing family, making new friends, joining a social or professional organization, etc. Therefore, we suggest taking 15-16 hours your first semester and not taking all Honors courses. This way, you will not risk your GPA from the start. However, this is simply a suggestion; students should make their own determination about their abilities for handling first semester challenges. Q: How does advising in the Honors College work? A: Honors College students should see their advisor in their major college for advising and clearing of their PIN before they are scheduled to register. Students should check the Registrar’s block on myBama for their registration schedule after fall of their freshman year. A student’s day/time to register is determined by the number of earned hours. Honors priority means that students have priority to register before non-Honors students of the same academic classification, e.g., juniors. Your major advisor should know about Honors requirements, but students are welcome to talk to an Honors College staff member about ways to dovetail Honors (UH) courses with requirements of their major/minor. Honors can also provide assistance with co-curricular activities to enhance your involvement and facilitate a holistic development approach. View Honors requirements. Q: What if I can’t get into the classes that I want? A: Don’t panic. 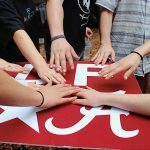 During Bama Bound, registration has already occurred for current students, but most departments/colleges hold seats for each incoming Bama Bound group. Most students are happy with the classes they get, but there are no guarantees during a student’s first semester. It helps to be flexible. If you don’t get a course that you want, take another course that will satisfy a core, major or minor requirement. Then keep checking myBama for open seats and take advantage of the fact that drop/add occurs during the first week of courses. Many students get into courses this way, and remember that you will have priority registration within your cohort beginning your second semester at UA. Q: The course I want to take says “Instructor permission required.” What do I do? A: Go to “Look Up Classes” in myBama, select the semester, then go to University Honors and view UH 405 sections. Under the title of each section is a link that says “Special Permission Required: Apply here.” Use this to submit your application. Q: I’m only a freshman, but I’ve heard there’s a way I can earn a Master’s degree in one extra year. A: Yes, the Accelerated Master’s Program is available in certain departments to highly talented and motivated students. Students may apply once they have 90 earned hours and a minimum 3.3 GPA. Learn more about Honors Credit.